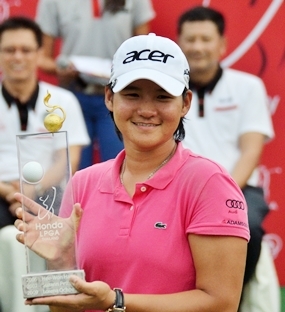 World No.1 women’s golfer Yani Tseng from Taiwan holds up the Honda LPGA Thailand 2012 trophy after a superb final round 66 at Siam Country Club Old Course on Sunday gave her back to back victories in the event. 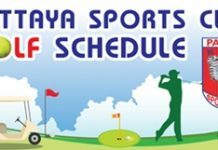 Pattaya (AP) – Top-ranked Yani Tseng successfully defended her LPGA Thailand title for her 13th LPGA Tour victory, with birdies on the final two holes last Sunday to hold off playing partner Ai Miyazato by a stroke. 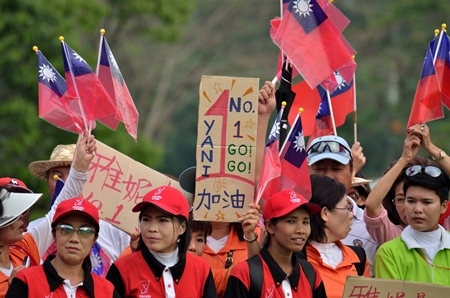 The 23-year-old Taiwanese star shot a 6-under 66 to finish at 19-under 269 on Siam Country Club’s Old Course in Pattaya. She opened with a 73, then shot consecutive 65s to enter the final round a shot behind Miyazato. Last year, Tseng won the event for the first of her seven 2011 LPGA Tour victories, including major victories in the LPGA Championship and Women’s British Open. The five-time major champion finished the year with 12 worldwide victories. She has 33 career worldwide professional victories. 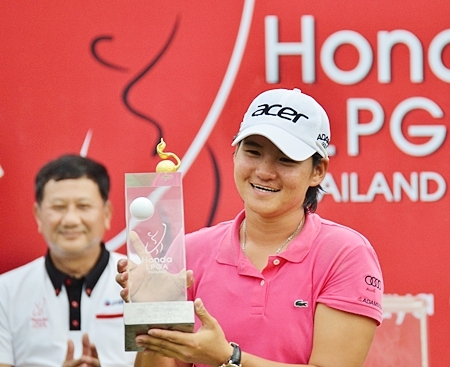 Yani Tseng celebrates after holing a putt to win the Honda LPGA Thailand 2012 at Siam Country Club. On the par-5 18th, she came through with the pressure on, nearly holing her 104-yard approach and tapping in for the winning birdie. Miyazato, the Japanese player who won the 2010 tournament, also birdied the final two holes in her 68. South Korea’s Jiyai Shin, who tied for the lead with Tseng after a birdie of her own on the par-4 17th, had a 67 to finish two strokes back. Yani Tseng shows off the trophy on the 18th green following the presentation ceremony. Tseng eagled the par-5 opening hole and Miyazato had a birdie, leaving them tied at 15 under. Tseng took the lead with a birdie on the par-4 third, and added birdies on the par-4 sixth and par-5 seventh. 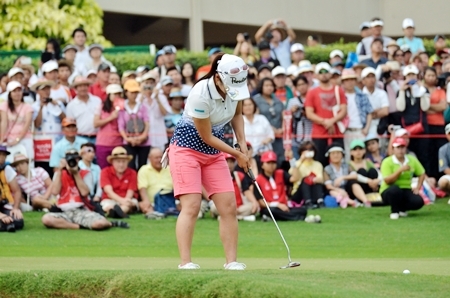 At the turn, she had a three-stroke lead over Shin and four-shot advantage over Miyazato. Shin, playing a group ahead of Tseng and Miyazato, birdied the par-4 10th to pull within two and gained another stroke when Tseng bogeyed the hole. Tseng pushed her lead to two with a birdie on the par-3 12th, but bogeyed the par-4 13th. Miyazato birdied the 10th and pulled within one of Tseng with a birdie on the par-4 15th, then matched Tseng with a par on 16 and the birdies on 17 and 18. South Korea’s Amy Yang shot a 69 to finish fourth at 14 under. 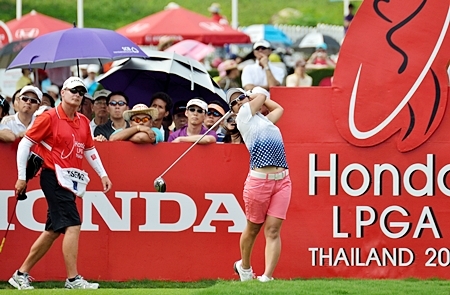 Sixteen-year-old Thai amateur Ariya Jutanugarn followed her third-round 65 with a 74 to tie for 12th on 7 under. 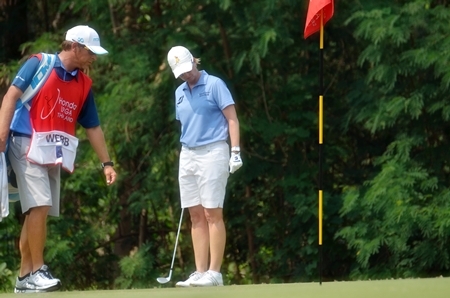 She played the final five holes in 4 over, making a double-bogey 7 on No. 18. Last year, Jutanugarn won the U.S. Junior Girls’ Championship and was the Rolex Junior Player of the Year. Second-ranked Suzann Pettersen had a 78 to drop into a tie for 21st at 4 under. She began the round four strokes out of the lead. Japan’s Ai Miyazato sinks a birdie putt on the final hole. Ai Miyazato tees off on the 10th hole during the final round. 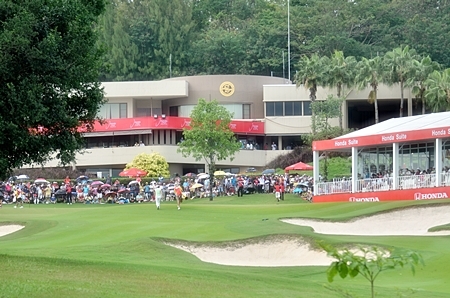 Crowds surround the green at the 18th. South Korea’s Jiyai Shin lines up a par putt on the short 16th hole. Karrie Webb of Australia watches a chip shot roll back to her feet as she takes a nine on the 7th hole to end her chances of victory. Yani’s fan club were in full voice throughout the tournament.